One of my passions is blogging. I used to own several blogs for many years . But after they were unceremoniously infected by the so-called ‘virus’, all my writings were gone in a split seconds. One of my greatest mistakes is failing to back-up all my writings, only some of it that I shared on social media servers, remained. Then I decided to just shared my thoughts on social media such as Facebook, Linkedin, Twitter, etc. til today. The urge of rekindle blogging on my own personal blog again surfaced this year. After much deliberation, I decided to continue what I loved most! These could be attributed to the newest passion of Bicycle Touring that started last year in September 2013. I wanted to keep on records what I’ve achieved and been through. It’s just to share my journey with others. 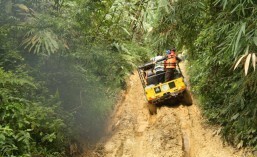 Apart from it, I will also post all my previous adventures such as mountain-climbing, jungle-trekking, etc. Pactrex is my nickname! Jailani Mahmood is my real name. You just need to type the nickname or my real name on google, and all my other social media sites will be displayed. Feel free to explore my passions from these social site to get to know me better.